Carroll County Animal Protection League-CCAPL - By-Laws & past info. October 15, 2010: The final bill has been received from Shecklers Excavating, Inc. The cost of the two-way (Phase III) driveway is $16,700.32. This bill will be paid as soon as it is received by our Treasurer, Patti Willoughby. The next phase, Phase IV, is the well-drilling and sewer system installation. There have been three bids received so far for the well-drilling. Because we took in over $4,000.00 from the Benefit Dinner and Silent Auction October 9, 2010, this money could very well be applied to the well-drilling operation. The CCAPL Board of Directors have a meeting on Wed. October 27th, to vote on the well-drilling bids and to also determine if we will have this part of Phase IV completed before winter arrives. Stay tuned folks. We are making progress. (If anyone would like to contribute to the well-drilling project, please send a donation to us at our P.O. Box address in the home page. Or, you can even use our PayPal payment method for your convenience.) Thank you so much to all for your continued support and belief in us to get an animal shelter built for Carroll County! September 7, 2010 update: The driveway is done! Check out the last photo of it in our "PHOTO GALLERY" album. The asphalt apron has been applied to the entrance. Thanks everyone for contributing to this project in so many ways. Our hard work at many fund-raisers and contributions from our awesome members, civic organizations, and grants, has paid off and we have this Phase III completed. We will update you when the final bill comes in! August 31st, 2010 - Work on the driveway is almost complete. Pictures of the driveway construction are in the "PHOTO GALLERY" album "Driveway Project"for viewing. The picture with the orange cones at the driveway entrance is where the asphalt apron has to be placed yet. Thanks everyone who contributed to this Phase III two-way driveway project. Total cost will be announced as soon as we get the bill! August 20th, 2010: Work began this morning by Shecklers Excavating, Inc. on our property for the driveway project! YES! August 12th, 2010 update: The bid packets were sent by FEDEX on Monday, August 9, to prospective contractors for the two-way driveway entrance. The delay in sending was because the person at ODOT retired and our application was not processed for a month it was there. So, Mr. Hettler received a verbal okay so he could finally send out the bid packets. Contractors have until Aug. 17th. to respond. Then the CCAPL Board of Directors will choose a contractor and the work can begin and get finished as planned by September, 2010. Please bear with us, as some things are out of our hands and we have to wait for things to happen in their time. We appreciate all your continued support and belief in us. Check out our "Coming Events" for fund-raisers in your area. Plus, if you are not from the area, you might like to participate in our present on-line "Flower Power" fund-raiser! This money generated from this fund-raiser will go towards the driveway entrance too! Thanks, everyone! July 1st, 2010 Update: The sign is up on our property! Many thanks to Jeff, Shelley & Jr. member, Brock Albaugh for painting and erecting the sign. A picture of it is in the Photo Gallery so check it out. Phase III - Two-way driveway project. By July 6th, 2010, Mike Hettler of Hettler Engineering will be completing the plans for the driveway project, submitting the application to ODOT for the driveway construction, then sending bid packets to potential contractors once ODOT approves the application. We are waiting for the approval of the permit from ODOT. We will update you as soon as we know it was approved. If anyone else is interested in contributing to the driveway project, send a donation to us via regular mail to our P.O. Box address. An acknowledgement receipt will be sent to you for your contribution. Many thanks to all who contributed so far to this project. As soon as this project is ready to go after certain requirements are met and bids are in and one is accepted, we will update you. 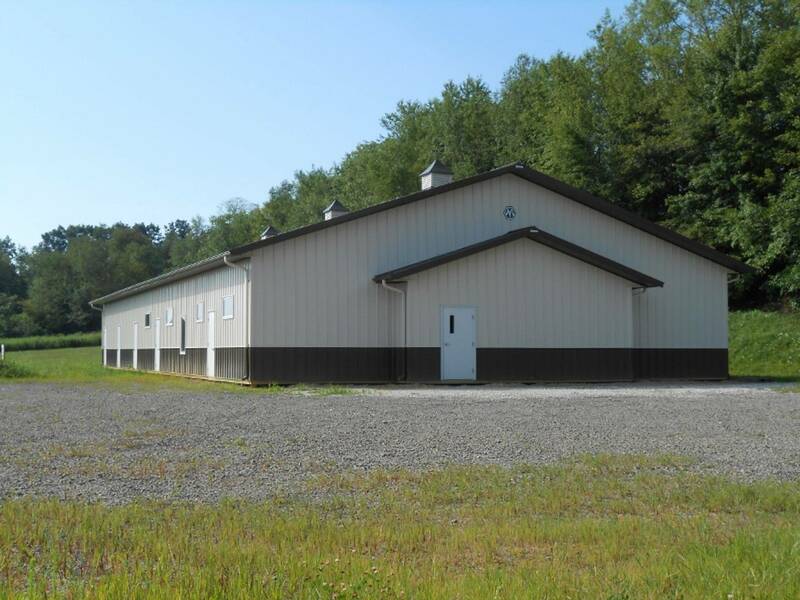 June 2010 Update: We are pleased to annouce the CCAPL Board of Directors have voted to place a sign at our property to let the public know this is where the animal shelter will be built for Carroll County! The directors also voted to have Hettler Engineering send in the ODOT permit, then the bid packets to contractors ASAP to do the Phase III two-way driveway entrance. The progress may seem slow at times, but we are moving along with diligence, determination, and perserverance. Building an animal shelter takes time, and the various steps of progress to complete are at times complicated and move slowly, but we are determined to do this ASAP! We are grateful to Shelley Albaugh for taking the position of Secretary for the organization. She will give it her all and will do a great job as will Jamie Rosenberger who has taken on the position of News Correnspondence Person for the CCAPL. Thanks Shelley and Jamie! PROGRESS IN THE MAKING! So far we have raised $5,850.00 towards the Phase III - two-way driveway construction and installation for early summer! How awesome! More grants and monetary contributions from various members have come through with anticiption of more to come from pending foundations and other resources. 2009 - Carroll County Foundation - $750.00; American Legion Post #375 - $200.002010 - January - Malvern American Legion Post # 375 - $200.00; April - Carrollton American Legion Post # 428 - $200.00; January-March - $2,300.00 from members, Valorie Herman, Jerry Thompson, Julie Gore-Fields, Paul & Sharon Klein, and Elaine Painting, April- Carroll Electric Coopererative "People for People Fund" - $1,000.00, Minerva American Legion Post #357 - $200.00, Malvern Alpha Sorosis Ladies Group - $100.00, May - John H. & Eveyln L. Ashton Preservation Foundation- $500.00, Great Divide Ruritan Club - $50.00. July: Sara Klein - $300.00. Currently we are waiting approval from others Foundations resources and civic organizations to reach our goal of $12,500.00 for the Phase III project. More grant requests have been sent out. MAY UPDATE: According to the conversation with Hettler Engineering, it would not be feasable to install the parking lot drains or any other construction regarding the parking lot until the actual parking lot construction takes place. At the April 28th, CCAPL Board of Directors meeting, all directors voted to have Hettler Engineering start the process for the construction of the two-way driveway Mr. Hettler will send out bid packets to various contractors and apply to ODOT for the permit. Cost of this permit is $600.00. Also, more speaking engagements are lined up for April and May to civic organization who may choose to help us too. If you would like to donate to this project, mark your check "Driveway Project" and send it to us at our P.O. Box address: CCAPL - P.O. Box 353 - Carrollton, Ohio 44615-0353. Thanks to all so much for your support and belief in us to get this done ASAP! New update: January-2010. Hettler Engineering has the driveway estimate finished. Projection cost is: $12,500.00. If you would like to contribute to this project, send a check to the CCAPL, and mark it: "Driveway Installation donation." Or, you can even use our PayPal on this home page to make a donation towards this. We want to accomplish this in the spring of 2010. New update: October 17th, 2009. Hettler Engineering will be presenting the site plans for our review at the November 3rd. 2009 meeting. The driveway entrance being considered now onto our land is off the road right-of- way at the north end of our property. Check back on us as this website is updated weekly in the various catagories: Photos, calendar, coming events, blog, and others. Also, Keith Barnett, local singer/artist, graciously donated his "Free Will" proceeds from his concert at the Scooter's Restaurant on Canton Rd. Carrollton, Oho to the CCAPL on August 29th. Thanks, Keith and thanks to everyone who attended and gave donations for us! July 1st, 2009 - It is official! The CCAPL now has land! This is one of our goals we have achieved thanks to all of our animal-loving supportive members and the generous public, the Carroll Electric Cooperative, Inc. "People for People Fund" in which they contributed $1,000.00 towards the purchase of the land, and to our loan co-signers for their confidence in us! We have many steps along the way before the other half of our dream we have had since our inception in January of 2007 becomes the total reality we set out to achieve...an animal shelter! We are on our way! Now that the Carroll County Animal Protection League has made this commitment, we are on another leg of our journey in our quest to build an animal shelter for Carroll County! This is what the organization has always been about, and now the undertaking we are facing at this time and in the near and distant future is not only very exciting for our organization, but a commitment and a pledge to keep going for all the wonderful animals in need of homes in Carroll County once an animal shelter is built! With this commitment, we will have an obligation of a loan payment each month, and to cover this loan payment and still contribute to our shelter fund, numerous fund-raisers have to be implemented and carried out. Our efforts will escalate to acquire grants for construction and other needs which will definitely arise. In what way can you help? How about with your ideas, input, resources, and/or monetary donations at this time, periodically, and in the future! We need your help in any way you can. Attention Animal Lovers of all ages: The Carroll County Animal Protection League will be having their "Annual Meeting" on Tuesday, December 1st, 2009, at 6:30 pm. At this Annual Meeting, the election of officers and board of directors will be voted upon. The meeting will be held at the Carrollton Friendship Center at the Carroll County Fairgrounds on Rt. 9. New members are welcome and bring a friend! (Meetings usually last an hour.) Exciting things are happening with our organization! UPDATE: 11-4-09 - Mike Hettler of Hettler Engineering of North Canton was present at the November 3rd, 2009 meeting. Mike present site plans for the members to vote on. Option E was voted on unanimously. The animal shelter will be towards the back of the property with the parking lot in the front and north end. More details to follow. 9-1-09 - We are currently waiting for Hettler Engineering to finish the four site plans that need submitted to the EPA and ODOT. These should be done in by the November meeting to present. We have to choose one of the site plans. Once it is submitted, we wait for EPA and ODOT's approval. Past Update: We have recieved the letter from the EPA stating the sewer systems we need can be installed on the land we have purchased. Hettler Enginerring of North Canton, Ohio is handling all the required details, site plans, etc. Come to a meeting or a fund-raising event and find out what we are accomplishing! We need your help so we can make our dream become a reality! Note: During the winter months, if the Carrollton schools (Carroll County) are closed due to weather, the Friendship Center will also be closed, therefore we will resume our meeting the following month. See "Meeting Dates for 2009." Or, if the schools are not closed and the weather turns bad as it did for our January meeting, contact our Secretary Patti Willoughby at 330-205-9268 (9 a.m. to 8 p.m.) to find out if a meeting is cancelled. On June 10, 2009 we received the official letter from the EPA stating a sewer system can be installed on the land we are purchasing! Hetter Engineering Company will put together four plans to submit. Included with these plans will also be "the site plans" to show where the animal shelter will be constructed on the land, the parking lot placement, sidewalks, etc., and where the water well has to be dug. Also, ODOT requires a site plan for the driveway entrance. On May 5, 2009, we were approved for a $27,000.00 loan from Consumers National Bank in Carrollton to purchase 5.393 acres on State Route 43, between Carrollton and Malvern Ohio. A down payment of $10,000.00 will be given to the property owners. On April 24, 2009, four soil test holes were dug by A & J Cinson. These test holes were assessed by Bouder Soil Engineering. We are waiting for the official word from the EPA to let us know what type of sewer system is needed on this property. We have hired Mike Hettler of Hettler Engineering in North Canton, Ohio to help us with all that needs done to move towards our goal of acquiring land,and building an animal shelter for Carroll County. Another update: We also received word from the Caroll Electric Cooperative- "People for People Fund" that our $1,000.00 grant request was approved. This grant will be applied to the purchase price of the land. Things are happening and we need more volunteers, members, and certainly more donations. Won't you consider giving towards either the land purchase or the animal shelter construction at this time and in the future? Thank you! On July 15, 2008, we received $50,000.00 from the Carroll County Humane Society. This "Restricted Endowment Gift" must be used in five years from whence we received it to build an animal shelter in Carroll County, Ohio. This monetary gift goes back to them plus interest if we do not attain this goal. The money is in a separate savings account. The money cannot be used to purchase land, but strictly for construction, which may include a well and sewer system. Help pay for the land by giving a donation in any amount! We are registered with the IRS: 501 (c) (3) non-profit organization, and with the Attorney General's Office of Ohio and the State of Ohio. Thank you. Section 1 The name of the organization shall be: The Carroll County Animal Protection League, a.k.a., the C.C.A.P.L., an abbreviated version for the general public to use on correspondence or making charitable contributions. Section 2: The meeting place shall be at the Carrollton Friendship Center located at 100 Kensington Road Northeast, Carrollton, Ohio 44615, or a designated location if the aforementioned meeting place becomes unavailable or another meeting place is decided upon at a later time. The mailing and correspondence address shall be, P.O. Box 353, Carrollton, Ohio 44615-0353, until a shelter is obtained in the County of Carroll, Carrollton, Ohio, at which time a more suitable physical address would be attained. Section 1: The purpose (object) of this charitable organization is the prevention of cruelty to animals; the relief of the suffering among animals; the extension of continued humane education to further alleviate cruelty to animals; to raise funds to build and maintain an animal shelter for the County of Carroll, Ohio; and to continue humane education to the public on housing and adoption of unwanted and/or abandoned animals once an animal shelter is obtained. Section 2: It is also the purpose of said organization, once a shelter is obtained, to shelter unwanted and/or abandoned animals; to seek suitable homes for said animals and to continue the education to the public on the prevention of cruelty to animals. Section 3: Said organization is organized exclusively within the meaning of section 501 (c) (3) of the Internal Revenue code, including, for such purposes the making of distributions to organizations that qualify as exempt organizations under section 501 (c) (3) of the Internal Revenue Code, or corresponding section of any future United States Internal Revenue law or future federal tax code. Section 4: POLICIES: No part of the net earnings of the organization shall inure to the benefit of, or be distributable to, any of its members, trustees, officers or other private persons, except that the organization shall be authorized to pay reasonable compensation for services rendered and to make payments and distributions in furtherance of the exempt purposes. (c) No substantial part of the activities of the organization shall be the carrying on of propaganda, or otherwise attempting to influence legislation, and the organization shall not participate in, or intervene in, (including the publishing or distribution of statements) any political campaign on behalf of or in opposition to any candidate for public office. (d) Notwithstanding any other provision of these articles, the organization shall not carry on any other activities not permitted to be carried on (a) by an organization exempt from federal income tax under section 501 (c) (3) of the Internal Revenue Code, or the corresponding section of any future federal tax code, or (b) by an organization, contributions to which are deductible under section 170 (c) (2) of the Internal Revenue Code, or the corresponding section of any future federal tax code. The Carroll County Animal Protection Leagues conflict of interest policy will allow the board of directors, officers, and/or volunteer members to be aware of this conflict of interest policy and agree to follow it. (a) A full disclosure of the interested party of the potential conflict of interest will be let known to the Carroll County Animal Protection Leagues volunteer members, officers, and board of directors in a reasonable and timely fashion. (b) The person (s) whom the conflict of interest is regarding, will not be able to attend the meeting while the conflict of interest is discussed and voted upon, and recorded in the minutes. (c) Investigating alternatives that would not involve a conflict will be determined as to what is in the best interest for the Carroll County Animal Protection League regarding its goals and purposes. (d) By adopting this conflict of interest policy, it will establish procedures aimed at helping the Carroll County Animal Protection League prevent its directors, officers or members from receiving compensation benefits except described in ARTICLE III: Section 4: Policies- regarding reasonable compensation for services rendered which will be documented in writing with the date and terms of approved compensation. (e) A periodic review will be implemented for the Carroll County Animal Protection League to review its activities to make sure it is operating in a manner consistent with accomplishing its charitable purpose and does not result in private inurement or private impermissible private benefit. (f) The assets of the Carroll County Animal Protection League are solely for this organization, are used to benefit its charitable purpose, rather than principally benefitting a private individual. Section 1: Any adult person eighteen, (18) years or older shall be eligible for membership in the organization, (unless the person is described in ARTICLE VI -Section 7), and shall become a member upon completion of the organizations application form and payment in full is made as described in ARTICLE IV: SECTION: 5, of the annual dues. Section 2: Membership shall be of two (2) classes. Supportive and Junior. Supportive membership is $15.00 annually and must be of the age of eighteen (18) years old and older. Supportive members will have voting privileges and also may be elected to office and/or serve on a committee as long as their annual dues are paid as described in ARTICLE IV: SECTION: 5- for the current year. Section 3: Junior membership is of the age of seventeen, (17) years and under. Junior membership is $5.00 annually and Junior members may volunteer to serve on a committee. However, they do not have voting privileges until the are eighteen (18) years old, and an adult member. Once a Junior member turns eighteen (18) years of age, when the renewal of dues are due, he or she will be classed as an adult, and will pay the current adult membership fee annually as described in ARTICLE IV: Section 5. Section 4: Current Supportive members will have the right to cast one vote. Voting by proxy will be determined by the Board of Directors. (a) If dues are not paid by January 1st, the secretary will notify the member (s) by written notice. The member (s) have sixty (60) days to pay their annual dues or they will not be a current member until dues are renewed. Section 5: Current supportive and Junior annual membership dues shall be payable on or before January 1st, of each year. (a) If dues are not paid by January 1st, the secretary will notify the member (s) by written notice. The members have (sixty) 60 days to pay their annual dues or they will not be considered a member, until dues are received. Section 1: Special meetings of the members may be called at any time by the Board of Directors or any ten (10) members qualified to vote upon filing with the secretary a written request for the meeting stating the purpose or purposes for the proposed meeting. Special meetings, for which written request is made, shall be held not less than thirty (30) days nor more than sixty (60) days after the filing of the request at a time and place that the President shall designate. Section 2: Advance notice of special meetings of members shall be given to the members by the secretary or in his/her absence by another officer. Section 3: A nominating committee shall be chosen at the September meeting, and this committee shall present to the members at the October meeting, those seeking office. Also, nominations from the floor may be accepted at the regular October meeting and the annual December meeting. The current Vice-President shall be chairman of the nominating committee. If for any reason, the current Vice-President cannot serve in the capacity of Nominating Chairperson, the President shall appoint another member of the Board of Directors. Any voting member may nominate one or more candidates for membership to the Board of Directors by written petition filed with the nominating chairperson at least fifteen (15), days prior to the annual meeting. Section 4: At any meeting of the C.C.A.P.L., the members present shall have authority to transact all business that may come before the meeting, as long as the majority of the present membership shall constitute a quorum. (a) A quorum being two-thirds of voting members present at any meeting. Three members must be present to transact or conduct business and to vote upon issues before the members. Section 5: Regular meetings will be held once a month at a designated meeting place unless circumstances, such as inclement weather prevent the meeting from taking place. The next scheduled regular meeting will resume. Section 1: The concerns, directions, and management of the affairs of the C.C.A.P.L. shall be vested in the Board of Directors. The Board of Directors consisting of the present President, Vice-President, Secretary, Treasurer, and three (3) elected Board of Directors. A Board of Director shall attend all regular meetings, and Board of Directors meetings, and special meetings, unless otherwise incapacitated, Election of additional Board of Directors can be done at the annual meeting, or by a special meeting called by the President and the addition of a Board of Director can be elected by a majority vote of the present Directors. Section 2: The officers and the members of the Board of Directors shall be elected at the annual organizational meeting in December, when election of said officers and Board of Directors terms are expiring, excluding in the event of vacancy, see ARTICLE VII Officers Section 7: Removal of officer (s). Section 3: Upon election, the officers and additional Board of Directors shall serve a one-year term. Whereas, prior to the annual December meeting, additional Board members shall be elected, if needed, in accordance with Article VI, Section 1. Section 4: The Board of Directors shall be composed of not fewer than five (5) nor more than eleven (11) members. The Board of Directors shall have the power to add to their number as is necessary to remain a quorum. Section 5: Any adult member eighteen (18) or over is eligible for election as a Board of Director. Section 6: Any person convicted of "Cruelty to Animals" or who is engaged or has been engaged in "blood sports" involving animals cannot be a member or director of this organization. Section 7: Any person who is engaged in selling live animals to any form of animal research facility, establishment, or individual (s), cannot be a member or director of said organization. Section 8: In the future, if an Executive Committee is needed, this committee will be composed of three (3) or more of the current members, and such committee shall include the President and the Treasurer, and such other member as may be elected by the Board at its annual organization meeting, or at any meeting by authority of the members of the entire Board of Directors. The Executive Committee shall have and may exercise all of the powers of the Board of Directors when the Board is not in session, except such powers, if any, as the Board may specifically reserve to itself, or as may be specifically assigned to any other committees or any officer of the organization. The Executive committee shall adopt such rules and regulations as it may deem prudent for its management. The Board of Directors may provide such other committees as the Board deems desirable and may delegate to such committees such duties and powers from time to time as it shall deem necessary or desirable. Section 1: Terms of officers shall be one (1) year, served consecutively. An officer must attend all regular meetings and Board of Director meetings, or when a special meeting has been called, unless incapacitated. Whenever any vacancy shall occur in any office of the organization by death, resignation or otherwise, the vacancy may be filled by the Board of Directors. a. If and when an additional officer is needed, such as an assistant treasurer, or assistant secretary, or assistant Vice-President, one will be appointed by the Board of Directors. Section 2: The President shall preside over all meetings of the organization, the Board of Directors, and the Executive Committee and shall be ex-officio with vote, a member of all committees of the Board of Directors unless the President is incapacitated, and cannot serve. (See ARTICLE VII-OFFICERS-Section 4). If the President, being unable to serve as President, the Vice-President shall preside in the Presidents capacity as stated in ARTICLE VII-OFFICERS-Section 4. Section 3: The President and Treasurer shall make available to all members of the C.C.A.P.L. at the January meeting, starting in the year 2008, a comprehensive report of the programs, policies, possible change in bylaws, and a financial statement, including income, expenditures, assets, and liabilities, from the previous fiscal year. The President shall receive and report all correspondence. Copies of all files, records, and other documents shall be copied and passed onto the Secretary and both officers shall be responsible for their safekeeping. Section 4: The Vice-President shall fulfill all functions as the President when the latter is incapacitated, is unavailable, or for any reason cannot serve. Section 5: The Secretary shall take and preserve minutes of all meetings of the members of the C.C.A.P.L. organization and of the Board of Directors. The Secretary shall notify members and Directors of annual, regular, and special meetings by telephone, email, or postcard, and perform other duties assigned by the President and the Board of Directors. The Secretary shall cause the minutes of all meetings, including Board of Director meetings to be published in a legible form which shall be available upon request to all members, in a timely fashion. The Secretary shall receive and preserve copies of all correspondence, and shall have custody of all files, records, and other documents and be responsible for their safekeeping. (a) The secretary, upon his/her end of term served, must release any and all secretarial records to the incoming secretary. Section 6: The Treasurer shall receive and deposit in a bank designated and approved by the Board of Directors all monies and securities received through the mail, by hand, or in any other fashion designated to the C.C.A.P.L. The Treasurer shall disburse funds for reasonable reimbursement in accordance with a budget approved by the Board of Directors. The Treasurer will submit to the Board of Directors and to the members of the C.C.A.P.L. at the January meeting of the said organization, an annual report of all the income, expenditures, liabilities, an assets of said organization. Section 7: Removal of Officer (s). Officers serve at the pleasure of the Carroll County Animal Protection League or until their successors are duly elected. Said officers, if unwilling or unable to perform the duties of office as described, may be removed from office by a majority vote of the C.C.A.P.L. voting members present. A motion to vote to remove an officer for just cause can be made at any regular monthly meeting, upon the approval of the motion. The membership will be notified of the motion, by the secretary, and the votes will be cast at the following meeting by secret ballot. If an officer is removed, by vote of the members, of the pleasure to serve, his/her replacement will be replaced by special election at the aforementioned following meeting by the members present by secret ballot. Section 1: Upon the winding up and dissolution of the organization after paying or adequately providing for the debts and obligations of the organization, the remaining assets shall be distributed for one or more exempt purposes within the meaning of Section 501 (c) (3) of the Internal Revenue Code, or corresponding section or to a state or local government, for a public purpose. Any assets not disposed of, shall be disposed of by the Court of Common Pleas of the county in which the principal office of the organization is then located, exclusively for such purposes or to such organization or organizations, as said Court of Common Pleas shall determine which are organized and operated exclusively for such purposes. The Board of Directors of the organization may adopt a plan for the distribution of the assets of the organization in the event of its dissolution, but such plan shall not be inconsistent with the terms of this paragraph. Section 1: All meetings of members and meetings of the Board of Directors, and any other meetings pertaining to the C.C.A.P.L., will be conducted pursuant to the Modern Edition of the ROBERTS RULES OF ORDER. Section 2: The calendar year of the Carroll County Animal Protection League shall commence January 1st, of each year to December 31st. Section 3: Any volunteer helping with any fund-raising activities sponsored by the Carroll County Animal Protection League will be greatly appreciated. However, pursuant to ARTICLE IV - Section 2:,only paid members have voting privileges. Section 1: Amendment at Annual Meeting: These bylaws may be proposed for amending by the members at the annual monthly meeting, provided the proposal to amend is submitted in writing to the Secretary twenty (20) days prior to the annual monthly meeting. Amendments may be considered for change by the majority of voting members present at the regular monthly meeting, as long as prior notice is given to the voting members when the proposed amendments will be presented at the previous meeting. Notice shall be given to members of full voting capacity, notifying said members of the annual meeting at least 20 days prior to the annual meeting if bylaw changes are to be proposed. (a) submitted in writing and filed with the Secretary at the previous regular meeting. (c) entered upon the minutes. (d) Or laid over until next stated meeting, when if approved by the majority of members present and voting, it shall be adopted; provided, however, that any proposition may be acted upon immediately if no more than twenty-five (25) members object.